Shane Victorino and Ty Wigginton homered, Joe Blanton pitched seven strong innings and the Philadelphia Phillies beat Miami 3-1 on Thursday night in the Marlins' second game without suspended manager Ozzie Guillen. Blanton (1-1) allowed three hits and a run in his first start following an injured-plagued season. Blanton had two lengthy stints on the disabled list and pitched in only 11 games in 2011, the lowest for a full season in his career. 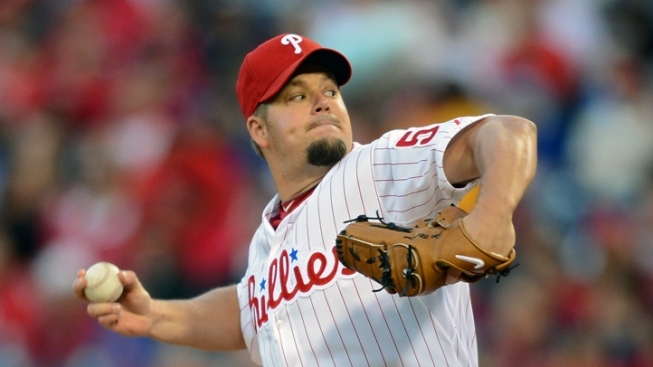 Blanton is often overlooked in a Philadelphia rotation that boasts three aces. Against the Marlins, he was as effective as he was during his first two seasons in Philadelphia. The Marlins lost their second straight game without Guillen. He was suspended five games by the Marlins on Tuesday for saying he admired Cuban dictator Fidel Castro. Jonathan Papelbon took the mound in the ninth to Marilyn Manson's “Antichrist Superstar,” and quickly ran into trouble. But he retired John Buck on a game-ending double play for his second save. Blanton outdueled Mark Buehrle (0-2) to help the five-time NL East champions win their second straight game and move back to .500. Blanton made only eight starts last season because of elbow problems. He was in a groove and had good command while throwing 85 pitches. The Phillies know they can count on Roy Halladay, Cliff Lee and Cole Hamels to help them overcome an offense weakened by the loss of Chase Utley and Ryan Howard. But Vance Worley and Blanton are rotation wild cards. Lee, Worley and Hamels are the probable pitchers for this weekend's three-game series against the improved New York Mets. Having Blanton back in the mix as a dependable starter would bolster Philly's chances to hold off NL East teams on the rise such as the Marlins, Washington Nationals and Atlanta Braves. The Phillies broke through for seven runs a night earlier against the Marlins after scoring a combined eight runs over the first four games. They couldn't put together a big inning against Buehrle - but a team that became annual contenders on the back of the long ball went deep twice. Buehrle retired the first nine batters before Victorino led off the fourth with a shot to left for Philadelphia's third home run of the season. John Mayberry Jr. added a run-scoring single later in the inning for a 2-0 lead. The Marlins made it 2-1 when right fielder Hunter Pence misplayed Buck's low liner and couldn't come up with the ball, scoring Omar Infante. That was it for the Marlins. Chad Qualls tossed a scoreless eighth, working out of a jam after Miami put runners on first and second with two outs. He caught Giancarlo Stanton looking at a 92 mph fastball to end the threat. Wigginton homered in the seventh to make it 3-1. Buehrle allowed eight hits, struck out two and walked none over 6 1-3 innings.